Today is an exciting day... my first giveaway! And it's a good one. As a graphic designer, I know how difficult it can be to find the right print services, and at a great price. Print Runner is a great place for almost anything you need to print! From business cards to posters, they have what you need and at great prices. Now for the goods. Print Runner has generously offered to give a free set of stickers to one lucky reader! These stickers would be great for so many uses! Small business marketing (calling all Etsy-ians! ), Crafts, Labeling etc. 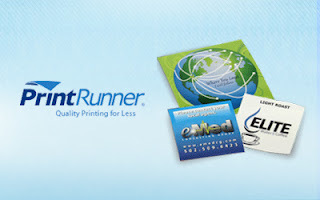 PrintRunner is your convenient online print service resource. Check out their site and try printing stickers from them today! So how do you enter? You have 4 chances to win! 3. Follow COZYmade on Twitter and/or Facebook. 4. Tell me what you will use your stickers for. and post a comment here for each entry. Giveaway ends at midnight on Sunday. Winner will be chosen at random on Monday March 12th and will be notified. Please make sure to leave an email address to contact you. Giveaway is open to US Residents only, ages 18 years old and above. Thank you to PrintRunner for providing this prize, I will receive a set of stickers for hosting this giveaway. This drawing is now closed. The winner has been chosen via Random.org. And the winner is...... Comment # 3 from jacki w. Congradulations Jacki. Hopefully there will be more giveaways in the near future, everyone else stay tuned! I follow cozymade on twitter & facebook. I've needed stickers to seal my packaging for a long time! Yay for a great giveaway!